There is a room in the bowels of the Ditsong Natural History museum in Pretoria. A secret room filled with treasure. It has a fairly innocuous name. In fact, to the casual passer by…it might be mistaken for a storage closet containing a janitor’s cleaning supplies. It’s called the Broom Room…and to those who love palaeontology…it is the Darwinian version of Aladdin’s Cave of Wonders. Robert Broom was in born in 1866 in Paisley in the UK. He settled in South Africa in 1897 and in the early 1900’s became professor at what was to become Stellenbosch University in the Cape. He was forced out of this position because of his support for Darwinism and evolution. 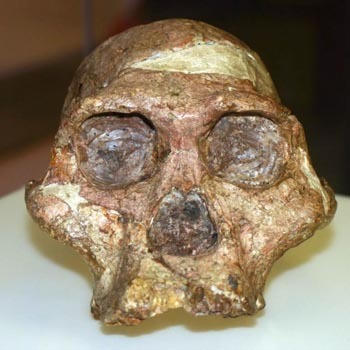 He developed an abiding interest in the search for fossils and this led him to Sterkfontein…now part of the Cradle of Humankind World Heritage Site. He went on to find and identify several incredible fossil specimens including the terrible and rapacious sabre-toothed cat Dinofelis as well as some of the most complete examples of our earliest hominid ancestors…Australopithecus…the most famous of these skulls now known by the nickname Mrs Ples. Broom passed away in 1951 in Pretoria. He left a legacy of palaeontological discoveries that have shaped our understanding of the world and the evolution and origin of our kind. The Broom Room…a security vault underneath a museum now contains the original specimens discovered at Sterkfontein and elsewhere. It boasts impressive steel reinforcement and modern climate control. Glass fronted cabinets line two walls and house a startling array of fossil fragments from a time before time. It is hallowed ground for anyone fascinated with our beginning, our origin. Legions of tourists visit the Sterkfontein Caves and the Maropeng Museum in the Cradle of Humankind every day. Few acquire the privilege of a walk down musty wooden staircases into archaic museum hallways that echo with the ghosts of a bygone era…to enter the Broom Room…and confront the original bone fragments of our past…the clues to the very primeval emergence of our species.